He sends it out each week. If you are interested in being added to his list, please email me and I will pass it along to him. Coach Mike Neighbors picked this drill up from Todd Schaefer when Todd was an assistant at Old Miss. Todd is currently serving as an assistant to Coach Neighbors at Arkansas. Here are links to 3 other passing drills that are posted on The Coaching Toolbox. Feeding a rolling post player is a must have skill for any guard who plays in a ball screen action offense. Without this skill, defenders can simply focus on defending the screen and subsequent potential drive to the basket. Set up chairs, cones, or balls in an arc. Wide enough that two balls fit in the space between them. Coach stands inside the arc as the receiver and return passer. Player starts in the corner. 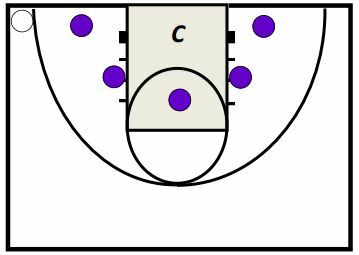 Simulate an on-ball screen. Explode from that simulated screen and deliver a pass that bounces in the area between the first and second obstacle. Coach returns the ball and player repeats the action all the way around and back. You can make this timed competitive or number competitive. For variety you can change the angles of the passes or decrease the distance between the obstacles.